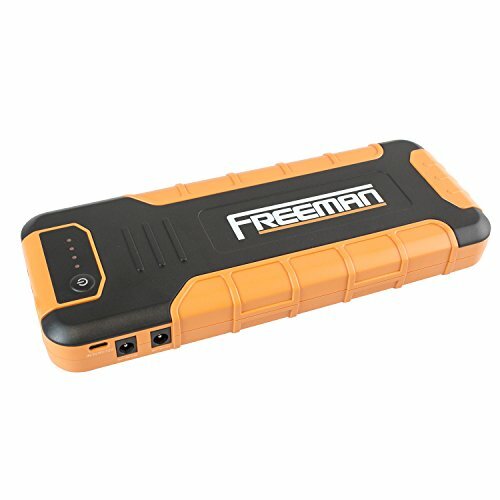 The Freeman 800 Amp Jump Starter and Power Bank is a compact and portable lithium-ion battery that can jump start 12V batteries in gasoline and diesel vehicles up to 10L including a compact car, sedan, SUV, full size pickup truck, boat, motorcycle, ATV, lawnmower, and more. Safely jump start a dead battery in seconds (up to 40 times per charge), or bring it along on a trip and use it to charge electronics on the go. With enough power to start large engines, oversized clamps, and extra-long heavy duty 8 gauge cords, this lithium-ion jump starter delivers an impressive combination of power and safety. With automatic built-in safety features including reverse polarity protection and a smart connector cable, you don’t have to worry about electrical sparking or battery damage if you hook the clamps up backwards. The smart safety connector monitors the polarity of each clamp and will not function until the clamps are properly connected, all communicated with bright warning lights on the side of the unit. The large and easy to handle clamps are sturdier than most, and the extra-long 15” cables easily reach your battery no matter how your engine compartment is configured. The unit automatically powers on when jumping your vehicle, and automatically powers off when not in use to prevent unnecessary battery drain. Featuring quick charging 2.0 ports, a micro-USB port, and 12V/19V ports, this lithium-ion battery pack easily charges laptops, tablets, phones, and USB 5V devices. Take it with you for long commutes, business travel, road trips, and more for extra charging power away from home. The Freeman Power Bank is TSA approved, making it the ideal in-flight carry on for long flights. This unit also includes an integrated LED light with three modes (normal flashlight, SOS, and strobe) to ensure safety whether you are camping, stuck on the side of the road with a flat tire, or just need a portable work light. The Jump Starter includes a wall charger, 8 adapter tips, USB charging cable, adapter cable, and a hard backed case and is backed by Freeman’s 1 Year Limited Warranty. If you have any questions about this product by Freeman, contact us by completing and submitting the form below. If you are looking for a specif part number, please include it with your message.